The new booklet from CFPB was designed in two sizes. The CFPB has released a new booklet to help Americans navigate the process of shopping for a mortgage and buying a house. The booklet aligns with the new Know Before You Owe mortgage disclosure rule and includes new information about how to use the Loan Estimate and Closing Disclosure forms. It will reach consumers applying for certain mortgage loans on October 3. 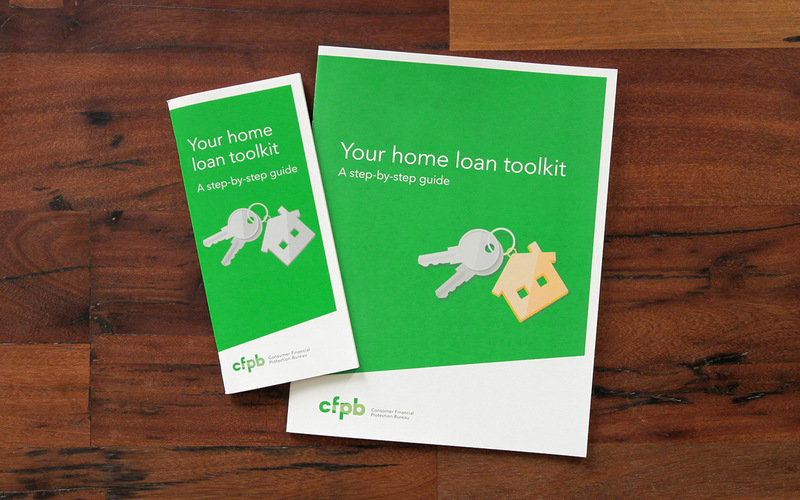 One of the primary goals of rewriting and redesigning this booklet, called Your Home Loan Toolkit, was to create a resource that would invite consumers to open, read, and learn from it. With this booklet, the CFPB has a chance to directly deliver unbiased and understandable information to people at a key moment in their financial lives. It was designed by the in-house team at CFPB to be consumer-friendly and fully accessible. The new booklet is written in plain language and features a clear, clean design. We ran usability tests with consumers and their feedback informed the final design. And, taking mortgage industry practices into consideration, we designed three formats of the booklet so it will reach more Americans without being redesigned by lenders. The toolkit replaces an existing booklet which was initially developed by the Department of Housing and Urban Development (see an earlier HUD iteration here). Creditors must provide the toolkit to home purchase mortgage applicants, potentially reaching millions of Americans each year. We completely rewrote the booklet and reduced the page count from 71 pages to 25 pages while incorporating many new statutory requirements. The new design has a simple structure and clear typographic hierarchy that flows logically and guides the reader through the content. Headers, large type sizes, and white space clearly organize the information. The toolkit features interactive worksheets and checklists, conversation starters for discussions between consumers and lenders, and research tips to help readers seek out and find important information. 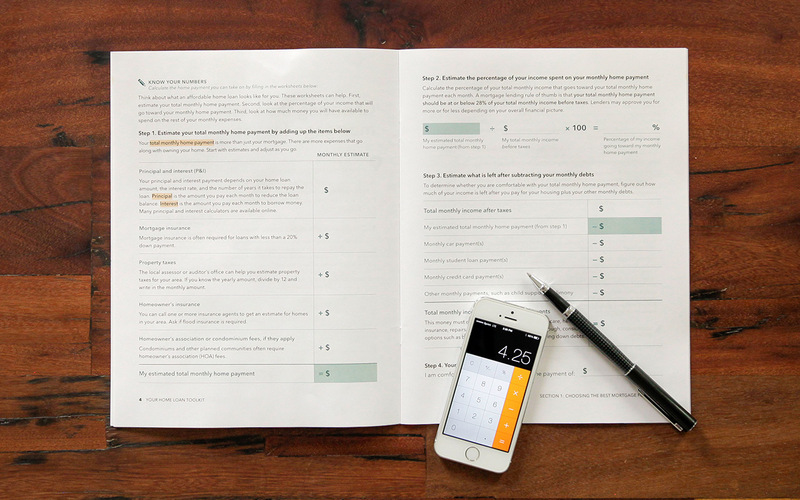 The new toolkit features a two-page worksheet to help consumers calculate what they can afford. We designed the cover to catch consumers’ attention, appeal to the end goal, and reach all types of homebuyers. We went through many iterations but ultimately settled on the simple moment of getting the keys to your new home. As we designed the booklet, we completed three rounds of qualitative usability testing in person, across 12 different cities. For all the sessions, we recruited consumers who met specific demographic and socioeconomic criteria, and were first time homebuyers who had recently taken out a mortgage or were planning to apply for a mortgage soon. We designed the first round of testing, in August 2014, to inform the overall concept of the booklet. We tested six-page sample booklets using three general ideas: a version that broke sections into time-boxed tasks, a version that focused on present and future goals, and the toolkit version. The three covers tested in round one, representing different booklet concepts. Elements of each concept ended up in the final design, but the nine consumers consulted preferred the toolkit concept. Next, in October, we wrote and designed the full toolkit and interviewed six new homebuyers, seven lenders, and nine settlement agents to provide direction on accuracy, completeness, and understandability of the booklet. Finally, in January 2015, we validated the new booklet against the old booklet with 33 consumers, to make sure that it was working better. During this these sessions, more than 90% of consumers preferred the new version of the booklet. 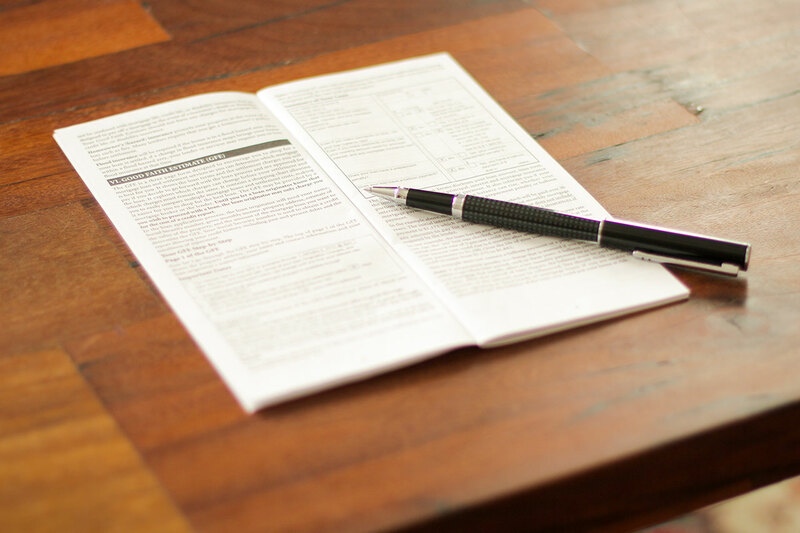 Under Regulation X, which implements the Real Estate Settlement Procedures Act, lenders may use any color, size and quality of paper, type of print, and method of reproduction so long as the booklet is clearly legible. Lenders are also permitted to change the cover design. In the past, vendors who supply lenders with the old booklet have reformatted it to fit into a small business envelope for easy and cost-effective mailing. These versions of the booklet used a very small type size and limited margins and white space. They were printed on thin paper using only two colors. Because we want people to get this information with optimized design and typography, we made a smaller version of the booklet that matches the two-color, business-envelope size specification. Redesigning the booklet for a smaller size was just like designing a website for desktop and mobile screen sizes. We hope that lenders and their vendors who want to save on mailing costs adopt this version instead of redesigning their own. Earlier versions of the booklet reformatted by vendors featured small type sizes, tight margins, and little white space. Though the majority of booklets are still delivered in print, many are now delivered electronically. We created an electronic version complete with fillable text fields and interactive check boxes so consumers can save and print their progress as they work through the toolkit. The electronic version meets federal accessibility standards to ensure that all Americans, including those with disabilities, can use the resource. To meet the standards, we identified content by how it is used within the document, set the reading order and tabbing order to flow logically, added internal navigation and links, included proper metadata, incorporated accessibility-friendly design patterns, and added descriptive text to all non-text content—like images and form fields. Finally, we produced Spanish language versions of the large print-ready and 508-compliant PDF formats of the booklet. You have the right to clear information before committing to a mortgage, possibly the biggest financial decision of your life. People with disabilities and Spanish language readers should have equal access to this information. We think you will benefit from the new toolkit’s plain language and organized design to help you navigate the complicated process of shopping for a mortgage and buying a home. Our online companion to the toolkit, Owning a Home, will help you go even deeper into the home-buying process. Please share the toolkit with friends and family who are planning to buy a home, and leave feedback on the design below. View our full source code policy.